Website Update: 3:00 p.m.: My Twitter hit 2,000 followers today 😀 Thank You! 16 days until Minutes Before Sunset release! One of my favorite parts about attending the University of Kansas is when I get the opportunity to meet authors, poets, and other writers in general. The English department (or creative writing) program here is pretty great that way. There’s always someone speaking on campus, but, even more so, authors sometimes come directly into our classroom. On Wednesday, April 10, that is exactly what happened in my NonFiction Writing I class. Rebein hasn’t lost his Midwest chivalry either. When I walked up and told him how much I appreciated his time, he gave me a signed copy of his book. Couldn’t be happier towards this experience. 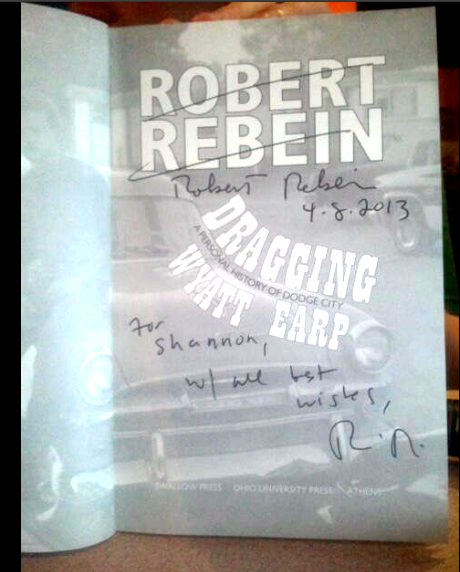 Robert Rebein, author of “Dragging Wyatt Earp: A Personal History of Dodge City,” came in, and, instead of taking the time marketing his own novel, guest taught us how he wrote nonfiction. He also answered our questions, elaborating on many aspects of writing we–as students–were wondering. I really enjoyed his advice. He was very relatable, and he easily adapted to our class (he is a teacher) in the sense that many of our students generally write fiction, and he compared the elements of fiction and nonfiction. He even admitted that he learned fiction, decided to take elements from it, and then moved over to nonfiction. Like James Baldwin’s personal essay’s, Rebein creates a memoir-essay that responds to life honestly, using personal ethics to bring life to the life he lived so many years ago and the history of the Midwest that lived so many years before him. I definitely recommend his work if you enjoy nonfiction. By clicking any of the links, you will be sent to his page for more information. ← Publishing News: I’ve signed with AEC Stellar Publishing! I also really like the idea that “Everything is in the service of theme.” I’m writing a nonfiction story right now, and am having a hard time not including every little detail, even the ones that don’t relate to the overall theme or point of the story. This is truly great advice! Thanks for the post! I’ll be sure to look up Rebein’s work sometime. Glad today’s post could be insightful towards your current project 😀 I wanted to include the ethics he talked about when writing nonfiction, but I’ll probably discuss that on a future post of “My Thoughts On.” Would love to hear your opinion on things. That will be a great post! I look forward to it. =) My class also had essayist Steven Church come in (his essay collection “Theoretical Killings” is fabulous and humorous and a little bit dark), and he talked about ethics in nonfiction as well. Mostly how no one has issues with being lied to in fiction, but the whole genre of nonfiction creates an implicit contract with the reader, the violation of which can cause serious backlash (just think about the Frey incident!). I took notes on it; I’ll have to go dig those up tonight. I’ll probably do a post on this in the future too, now that you’ve got me thinking about it. =) If you had specific things you wanted my opinion on, feel free to ask. I’ll let you know when I make my own post on ethics in nonfiction in case you’re interested!